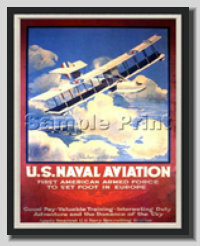 This reproduction depicts a great looking WW I vintage Naval Aviation recruiting poster. It States: First American armed force to set foot in <?xml:namespace prefix = st1 ns = "urn:schemas-microsoft-com:office:smarttags" />Europe. Good pay, valuable training and interesting duty. Adventure and romance of the sky. Helped promote PRIDE and HONOR in our military and country.